Short Mat Bowls is one of the versions of bowls. It is played indoors by teams of up to four players and involves skill and accuracy. We are a very friendly club with players of all ages. 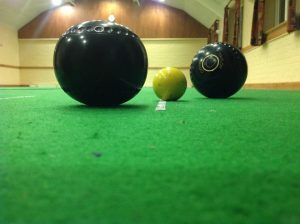 If you want to come along and join us at Nesscliffe Village Hall then we can show you how to play and you can borrow bowls from the club each week. Most Thursdays at 7:30pm. The exception is the third Thursday of each month when the hall is used by Great Ness WI. When this happens we meet on Friday instead.